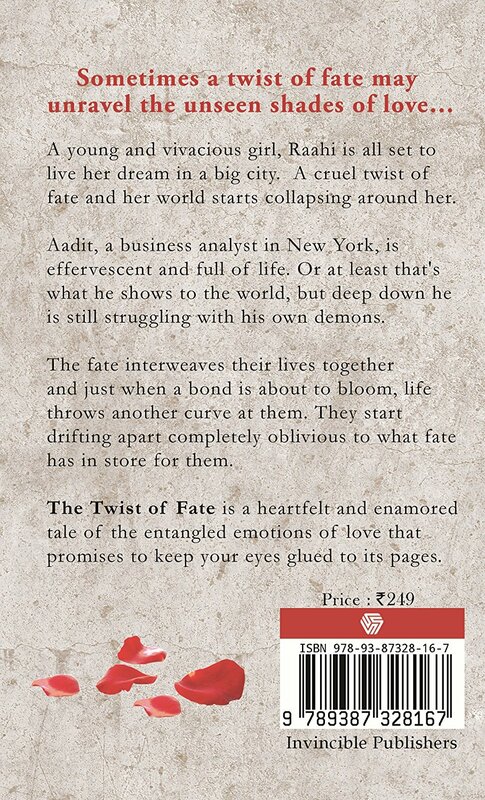 The Twist of Fate revolves around the life of two adults – Raahi and Aadit. Raahi, a door next girl with selfless love. Just when she rejoices with the thought that she has found her soulmate, she comes across her first heartbreak. Aadit, a business analyst in New York, has already suffered breakup and has also lost complete faith in love. Further, Raahi’s job forces her to move into Aadit’s house. When both were completely engrossed in living their life just for their ownself, fate has already started playing its game. What happened in Raahi and Aadit’s life?? Did they regained their lost faith in love?? What’s the twist that fate played in each other’s life?? The story is neatly weaved and the plot is easily relatable to every readers. The characterisation and narration is done to its perfection which helps the readers to maintain coherence throughout the book. Though the plot is not unique, the author has carved the story with unexpected twists and intriguing theme which makes the readers hooked up with the book till the end. The author could have furnished the plot more to present a fresh content. The usage of simple words and lucid language improves the readability. The story writing skill of the author is commendable. The facts, added by the author in bold letters spice up the story and adds more beauty to the narration. The cover page could have been more colourful and attractive. The title and blurb are intriguing and can make readers to pick this book. Also the blurb gives us hints on the content of the book and keeps us guessing. Overall, a commendable work by a debut author.